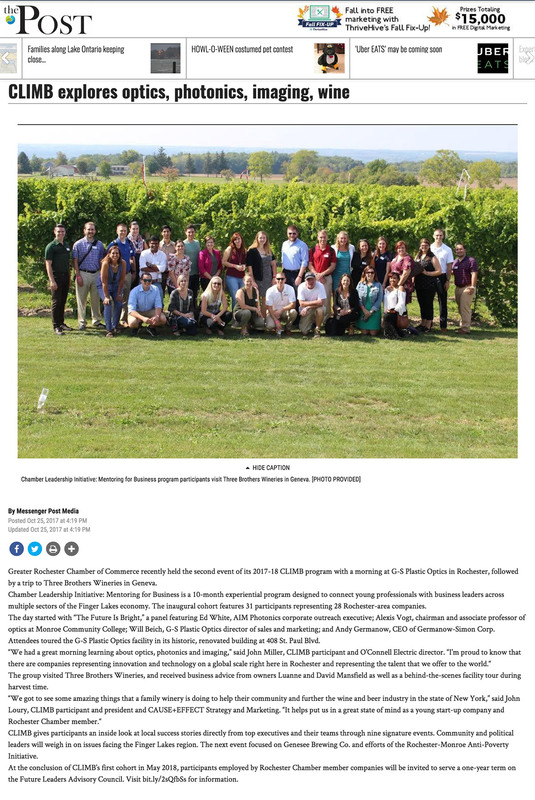 Greater Rochester Chamber of Commerce recently held the second event of its 2017-18 CLIMB program with a morning at G-S Plastic Optics in Rochester, followed by a trip to Three Brothers Wineries in Geneva. 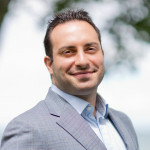 Chamber Leadership Initiative: Mentoring for Business is a 10-month experiential program designed to connect young professionals with business leaders across multiple sectors of the Finger Lakes economy. The inaugural cohort features 31 participants representing 28 Rochester-area companies. The day started with “The Future Is Bright,” a panel featuring Ed White, AIM Photonics corporate outreach executive; Alexis Vogt, chairman and associate professor of optics at Monroe Community College; Will Beich, G-S Plastic Optics director of sales and marketing; and Andy Germanow, CEO of Germanow-Simon Corp. Attendees toured the G-S Plastic Optics facility in its historic, renovated building at 408 St. Paul Blvd. The group visited Three Brothers Wineries, and received business advice from owners Luanne and David Mansfield as well as a behind-the-scenes facility tour during harvest time. CLIMB gives participants an inside look at local success stories directly from top executives and their teams through nine signature events. Community and political leaders will weigh in on issues facing the Finger Lakes region. The next event focused on Genesee Brewing Co. and efforts of the Rochester-Monroe Anti-Poverty Initiative. At the conclusion of CLIMB’s first cohort in May 2018, participants employed by Rochester Chamber member companies will be invited to serve a one-year term on the Future Leaders Advisory Council. Visit bit.ly/2sQfbSs for information.